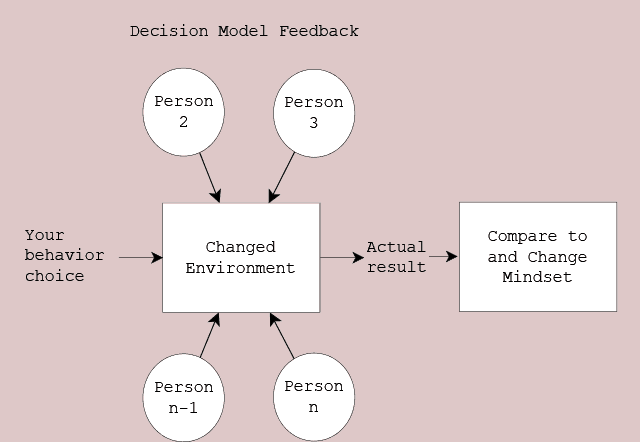 The Decision Model condenses the architecture of our behavioral decision-making. Even when we are adults, the vestiges of our march through developmental steps form the base of each succeeding step in the decision process. 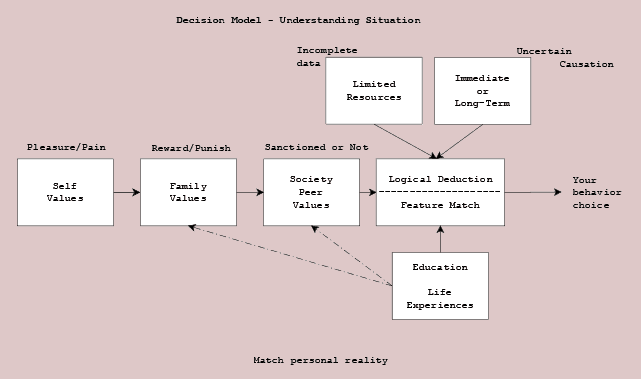 Starting at the far left of Figure 0.1 are the self values. Those values of pleasure and pain which we learned and which guided our behavior when we were infants. As we learned language and the values in our family, our personal values were often trumped by rewards and punishments in our behavioral choice. Once we were old enough for school and neighborhood friendships, we discovered that our family values were not sacrosanct. Away from home, our choices had a different latitude which was enforced by approval and disapproval. As we reached greater cognitive capacity, we applied reasoning on a situation about which we had limited information, uncertain grasp of linkages between events, and the speed at which we needed to make our response. Reasoning has two separate forms–logic and association–which swap their results with one another. As our personal experience widened, our peers related their experiences, and schooling taught us further relationships, our suppleness in handling situation grew. Some situations require immediate actions, like sports and safety, with immediate consequences. Others are long-term, requiring much effort and time, to achieve the end result. The assessment of this urgency and the need for immediate gratification is grounded in the first three steps of this process. Figure 99.2 gives the gist of feedback handling. Our behavior choice came with particular expectations of changes to our environment. However, in addition to any mistakes we may have in our calculations, other people (here numbered 2,3,…, n1-, and n) also act in that environment with their own needs, desires, and fears. The result of our action combined with others involved change the environment. We combine that actual result against our intention. Considering what we know of other people’s actions, any deviation results in changes to the values we use to assess situations. We may have an epiphany of self-illumination, or we may realize that certain acquaintances have shaded the truth, or that general beliefs we learned in school or from the media do not reflect our reality. If changes are made, they become the new base for the next situation we face.